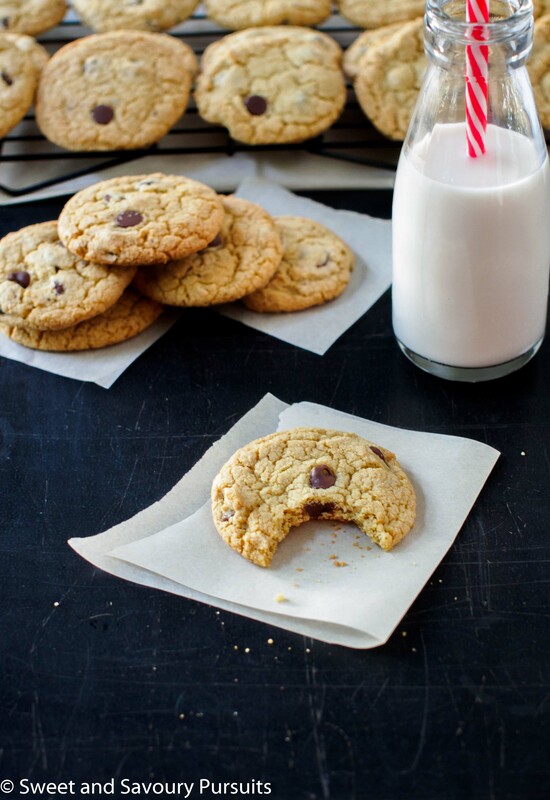 A delicious, quick and easy recipe for chewy Quinoa Chocolate Chip Cookies. My eldest daughter loves chocolate chip cookies, and I love baking them for her so whenever I have a bit of extra time I like to make a batch of these Quinoa Chocolate Chip Cookies for her. What I like about these cookies, other than the fact that they are absolutely delicious, is that there is some quinoa flour in them and although it would be wishful thinking to say that they are healthy, they at least have some additional nutrients that are not found in cookies made with wheat flour alone. I love combining quinoa flour with all-purpose or whole wheat pastry flour in cookies and muffins, I find it’s slightly sweet and nutty taste suits it perfectly for baking. The cookies have a beautiful crinkly top, are nice and chewy and quick and easy to make. If you have a craving for chocolate chip cookies or want to make a sweet treat for someone special, then I recommend you bake a batch of these Quinoa Chocolate Chip Cookies! In the bowl of your stand mixer cream the softened butter and brown sugar together for 2-3 minutes. Add in the egg and vanilla and beat until well blended. Add flour, quinoa flour, baking soda and salt and beat until no traces of flour remain. Add in the chocolate chips and stir until they are well-distributed in the cookie dough. 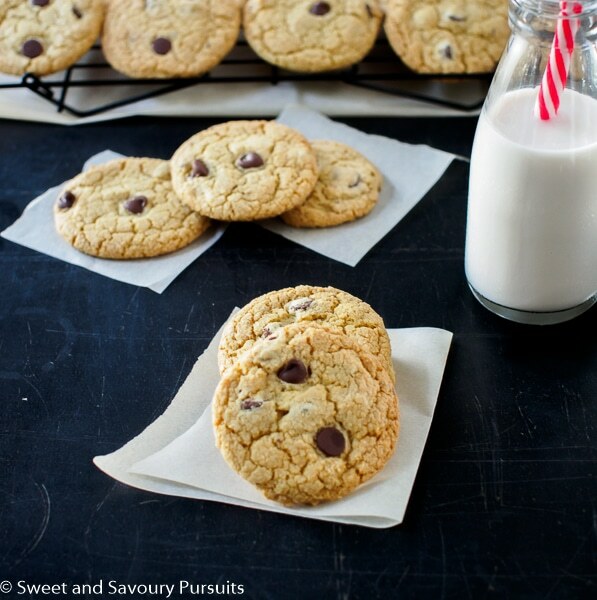 Using a size 50 scoop, or a tablespoon, scoop out evenly sized cookie balls and place on a baking sheet approx. 2 inches apart. Repeat this process until the tray is full. Press gently on the cookies to flatten the tops out slightly. Bake in the oven for 10 to 12 minutes, or until cookies are golden brown. Let the cookies cool on the baking sheet for a couple of minutes and then move them to a rack to cool completely before storing them in an airtight container. The cookies will keep well in a covered container at room temperature for up to 5 days. I always put some cookies in a freezer bag and freeze them for later. These look sooo amazing! I have been dying to use quinoa….maybe this is the recipe! Hi! I hope you do try them. These cookies have become my daughter’s favourite, and she can be quite the critic! Interesting recipe. I love all the alternative flours that are available now – all of a sudden there are so many new flavours to try in baking – wonderful! Thanks! I completely agree it’s so much fun to try different flours in baking. I love those crackly tops, Fida! Thanks Patty, I really like that too 🙂 Have a great day! 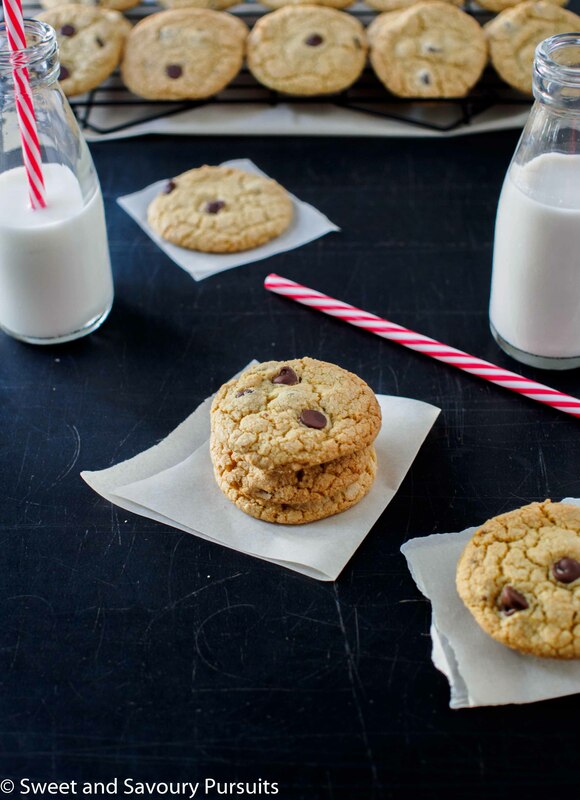 Great recipe, love that there is some quinoa goodness in these delicious cookies, pinned! Thank you, so do I and yes she loved them! Thanks Natalie, I think you will be very pleased with the taste of quinoa flour in baked goods, it’s delicious!